A financial advisor can be the single greatest asset to you, your family, and your business. The financial advisor you choose to partner with, will be by your side for decades, not days. They will be the voice of reason in times of uncertainty. The person you call on when you need advice. The trusted voice on the other end of the phone, when you aren’t sure where to turn. They can be the difference between reaching your goals, and falling short. You deserve to choose the best financial advisor for you and your family. Nothing means more to us than the impact we have on the lives of every person and family we serve. What makes us different from other financial planning firms isn’t revolutionary. It simply is what makes us who we are. And we wouldn’t have it any other way. Fiduciaries: As investment advisor representatives, we are proud to hold the CERTIFIED FINANCIAL PLANNER™ As fiduciaries, the financial advice we provide is objective, free from outside influence, and solely in your best interest as our client. It is our personal privilege, and legal obligation, to put your needs, first. We are honored to uphold the best practices and guidelines of The CFP® Certification: The Standard of Excellence, and deliver financial planning services that are centered around our clients. Steadfast Stewards: We are the one you call on in the middle of the night, after the unexpected loss of your spouse. We are the advisor who will be there for you when you lose your job, and need guidance. We are the shoulder you can cry on in times of pain and the arms that will hug you in times of joy. We answer our phones, respond to your emails and are truly dedicated to helping you navigate through the ups and downs of life. 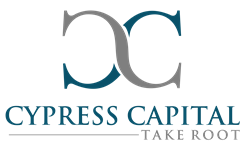 Partners: When you choose to work with Cypress Capital, you are choosing a long-term financial planning partner. We believe in building relationships with our clients, their families, and their businesses. Long-term goals require long-term planning, and it is our intention to be with you every step of the way. What we do for our clients is so much more meaningful than helping them set a budget, or telling them where to invest their money. Anyone can do that. We come alongside our clients and help them build a plan for the future. A plan to help them pursue their goals and live the life they have always imagined they would. A solid financial plan is built on more than crunched numbers and future projections. It is built on a relationship. Without the foundation of a trusted advisor-advisee relationship, even the most well-structured plans will eventually fail. At Cypress Capital, we nurture relationship growth between ourselves and our clients throughout the planning process. Financial planning is both complex and personal. During this process, our goal is to pull all aspects of your financial life together, to help you make sense and maximize your money. As CERTIFIED FINANCIAL PLANNER™ Practitioners, we follow the traditional financial planning process. Every step of our process is designed to help you reach your defined future goals and objectives. After the plan is in place, we consistently monitor it and make changes if and when they become necessary. Whether it’s personally or professionally, finances are at the core of your well-being, and have a profound psychological ripple effect in every aspect of your life. Whether it's your corporate capital, your human capital or your personal capital, you need an advisor that understands the value of each, and the worth to you, personally. You need someone who is willing to grow with you and your needs over time. At Cypress Capital, our planning philosophy is about taking root. It’s about an advisor relationship that starts from a seed, and is nurtured over many generations. The key to a successful financial plan isn’t in the investments, or the products. It’s in the relationships. We encourage every person who walks through our doors, to find an advisor they know, like, and trust, fully. Without this essential component, the taking root philosophy is not possible. Our clients excel, because they have been empowered to make educated decisions regarding their wealth. They enjoy working with our team, because we sit on the same side of the table. We spend time educating them on their options, and tell them the truth - even when the truth hurts. Our clients thrive, because they fully trust in our advice, and never have to worry about whether we are trying to sell them something. Motives-based financial planning has no place here. You don’t need an advisor who gets paid to give you investment advice to “outperform” benchmarks. You need an advisor that can help you break down financial complexities into manageable goals that fuel momentum, and drive you to be the best possible version of yourself. You need an advisor who truly cares about taking root in your life. Not just today, but for the endless tomorrows to come. At our firm, our mission is simple: Empowering you to feel emotionally, mentally and physically stronger because you have sound knowledge of your financial situation and can properly plan for all of life's tomorrows. We take the time to learn more about you, understand your needs, wants, and goals, and help you identify the personal finance strategies that may improve your lifestyle today and provide the foundation for a sound retirement in the years ahead. We understand today’s financial environment. We understand that individuals and business owners face unique challenges as they prepare for retirement; and we can help take the mystery out of preparing for today and tomorrow.